Two Engineering students invented a cheap device that collects stray microwave signals in the air and converts them into power for charging batteries. 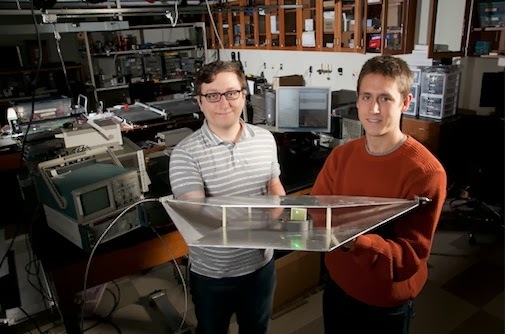 The invention works similar to solar panels, the researchers claim that their converter can collect stray signals anything wireless, including satellite signals, sound or even Wi-Fi. They used fiberglass and copper energy conductors engineered to capture various forms of wave energy and tune them for useful applications. The research team created a series of fiber glass and copper energy conductors on a circuit board that converts microwaves into 7.3V of electrical energy,according to gadgetronicx2.rssing.com. 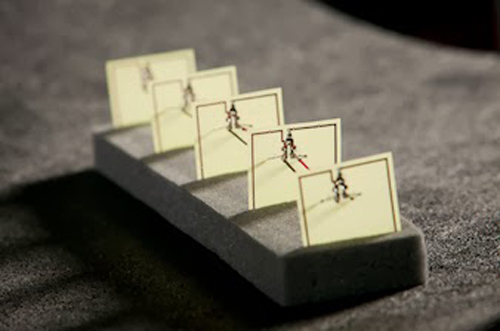 “We had been getting efficiency around 6 to 10%, but with this design we were able to dramatically improve energy conversion to 37% which is comparable to what achieved in solar cells”, said Allen Hawkes. This was the five cell metamaterial array developed by the engineers and the beauty of this design is that the basic building blocks (metamaterial cell) are self contained and additive. So one can simply add more blocks to increase the electric power based on their needs. This device could be tuned for a multitude of frequencies to collect different types of energy including vibration and sound energy. The researchers further added that this power harvesting device could integrate into modern mobile phones, allowing it to recharge itself from the signal obtained through towers or satellites. In a world where we are swimming in microwave signals, this device could provide a vast amount of energy which we need on daily basis. Imagine charging your smartphone through Wi-Fi signal or by means of stray signals from the Satellite overhead. This cheap and effective device could be a best solution to meet the energy needs of the world in our upcoming future.